In rural Dalaston, a quiet wedding festival is ruined when a rampaging dragon descends from its mountain aerie to rain fire and destruction on the peaceful celebration. In desperation, the town’s leader turns to a mysterious stranger who promises protection from the dragon—in exchange for a few sacrifices. Now the children of Dalaston rise from the dead as ghastly abominations to enforce martial law and kidnap people for their mysterious master... including the blushing bride herself. With time quickly slipping away, can the PCs break the undead curse on the town and stop the dragon from destroying what remains? 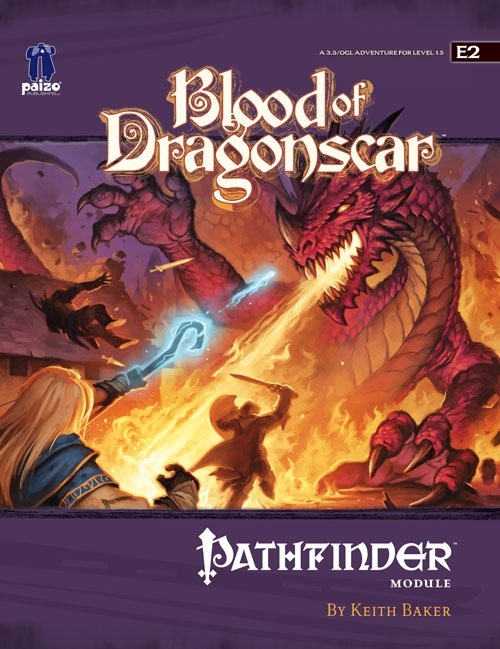 Blood of Dragonscar is a dragon-slaying city adventure for 15th level characters, compatible with the 3.5 edition of the world’s most popular roleplaying game. Within you’ll find information on the mining and brewing town of Dalaston, new monsters, a draconic lair deep inside an active volcano, and the fire-breathing dragon itself. This adventure takes place in the decadent nation of Taldor in the Pathfinder Chronicles campaign setting, but can easily be adapted for any game world. 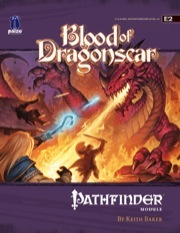 Pathfinder Modules are 32-page, high-quality, full-color, OGL-compatible adventures for use with the 3.5 Edition of the world's most popular fantasy RPG. This Pathfinder Module includes four pre-made characters so players can jump right into the action, and full-color maps to enhance play. I just ran the adventure this past weekend and the players thoroughly enjoyed it! I had converted it over to Pathfinder, so there was some issues with the CRs matching to a party of 15th level adventures (and a misunderstanding on our part of the Paladin's Aura of Justice ability), but it did not detract from the story or gameplay at all. I highly recommend this to all to run as a one-shot to introduce players to high-level play in Pathfinder since it helps show exactly what the classes can do when they get to 15th level. "Keith Baker knows how to write creepy!" We need more modules like this! I don't think I've ever seen a high level module made this compactly before. Great use of space, and I love the hand waving of townsfolk. At this level, you can just walk over them if you really want to. Of course, that wouldn't make the characters very heroic. There isn't enough high-level content being published. This is a great module and can easily be fit into any upper level campaign. Every should pick this up so Paizo will be convinced to do more like it. One of the most common complaints about creating high-level adventures is the space involved to do them justice. A High level stat block can take up to two pages of text, and unless your module is heavily reliant on the Monster Manual, each new encounter is a slice away from the flavor text, the city map, or the plot hook. Nonetheless, Mr. Baker manages to squeeze an entire high-level adventure into 32 pages. Two methods drastically cut down on the endless stat blocks. One, basing three common creatures found in the module on the same template, turning three stats blocks into one and a half; and two, "handwaving" several possible encounters by putting creatures well below the Party's expected challenge. This is a practice best used sparingly, but if ever there was a time for the players to mop the floor with the opposition, it's 15th level. Note that most of these encounters are not necessarily meant to result in combat, but if they do, they don't bog the book down with text. Okay, so Keith can write economically, but is he any good? Previously, I've only read portions of his work with the Eberron Campaign setting, but this module proves he can excel in the Pathfinder universe. The module has that sense of dread that the PF adventures love to dole out. Mr. Baker also incorporates investigative and roleplaying tactics, and the adventure is nonlinear enough to give the players options. I also commend the use of Taldor, which until recently received little attention from Paizo. In short, Keith Baker proves that there is a formula for concise, high level adventures, and I hope we see more from him, in any capacity. Is the cover art a mock-up? I assume it is, but I haven't seen that art before. Also, another Event module. Now we just need another Treasure Chest. Mock up. Art is in J2, Guardians of Dragonfall. Oh. That one's been on my "to buy" list for awhile. Hmmm... Keith Baker... I know that name, don't I? I'll be happy to see a good high-level addy out there, assuming this works, but this one is an assumption and not an automatic for me, compared to so much of Paizo's recent and announced near-future stuff. Keith's a very creative and intelligent guy. I'm sure he can do high-level stuff just fine. Can't wait to see it. I thought it was just major High-level NPCs. That way, you don't get the "Yeah, he could save the world, but he's busy right now doing, um, something else" effect. (sigh) Nobody gets my jokes. I thought you might have been joking, but my "give informative answer" reflex kicked in anyway. Whoo-hoo! Another event module! Yes!!!! I remember hearing fairly recently that "The Demon Within is as high level as we're going for a while." And now this. I like high-level adventures, and I'll be interested to see how this one plays. One thought, though: if most Pathfinder adventure paths finish with characters in the 14th-16th level range, perhaps any 15th+ level adventures, like this one, should have a couple of sidebars like "Running this Adventure for Characters That Have Just Completed Rise of the Runelords" or "Running this Adventure for Characters That Have Just Completed Curse of the Crimson Throne" in order to provide a good tie-in for DMs to keep running the same group just one more time. and also: Yay, another module! Nah, I can hardly agree. I think that after compleating an archplot of a scale such as shown in the APs, you should give your charcters a rest, perhaps even ran an edventure in a diffrent system. Is this the "Fight the Dragon, save the virgin" module mentioned at Gencon? Im new to the Paizo Pathfinder series and I was looking for more modules and came accross this thread. So there's no high/epic lvl modules comming out? So far this is the highest level mod to date. The final volume of each Adventure Path is generally in the mid-teens as well. I imagine that we'll see an epic adventure to coincide with the release of epic rules for the Pathfinder RPG, but that will most likely be in 2010, as next year is occupied with the launch of the primary core. I could also be completely wrong, as well, and this might be it. As I'm currently taking over as GM for a group of 7-8 players Ive been looking for good material to use. In 2nd ADD, I generaly just made my own setting and addhocked as we went. This time around I was hoping to not have to spend that much time designing everything. I purchast the first module in the Rune Lords series and was looking to see if the charectores could advance past the last module in the series and still play within the same setting. I guess Ill have to spend the time designing higher lvl games after all. Whats the chance of me submitting the modules I create to Paizo? Whats the chance of me submitting the modules I create to Paizo? The chance of you submitting them is up to you. The chance of them publishing them are not high. Currently Paizo is not accepting unsolicited material for publication. There will most likely be open call opportunities in the near future, either through another RPG Superstar contest or set piece/PFS scenario open calls, so keep your eyes peeled for that. I can't wait till this hits print. I'm intrigued by the encounter based design and the high level content. I've got tons of low level modules and while Crown of the Kobold King et al was fun I'd like to beef up my collection of higher level adventures for the foreseeable future. I did not enjoy "Shadows of the Last War" also by Keith Baker for the Eberron campaign setting. It really seemed like a dice-stacking sort of adventure to me. I really was bored reading it, nevermind playing it. I really enjoy Keith's fluff, but thus far my opinion has been that his adventure writing needs work, as I do not find it entertaining. That said, I will wait for the reviews. I really hope this one changes my opinion! I've updated the cover image and description to match the final product. I remember a thread over on EnWorld discussing the lack of a 'Fight the Dragon, save the Princess' type adventure, in all versions of D&D. Which was odd, given that the game is called Dungeons and Dragons. It seems, however, that this module will fill that gap quite nicely. Which looks awesome. I wonder how quickly this module could be run though. I am not a fan of Eberron (I think it was the worst thing to happen to DnD until 4e came out...but that is just my opinion) so I've never been much of a fan of Mr. Baker. However, this is one absolutely amazing module! Seriously, this is a great adventure - classic themes, tough adversaries, interesting uses of existing critters, and a dragon at the end. How much more old school can you get in such a modern format? I just read this one yesterday, and I have to agree with D.F. with regard to the module. It is smartly written, and seems to have prepared DMs for the most obvious questions/situations involving PC choices. All of the artwork is well done, and more importantly it is all useful. Nice work. I recieved this and PF # 20. I picked this one up to read first. All I can say is that Keith Baker did a good job on this module. He created Eberron, if it's the same Keith Baker. Seriously, nobody gets my jokes! Anybody know what level would the characters be at the end of this module? I'm thinking of using it as the climax of my dragon themed campaign, but I don't want to go much beyond 15th level. Assuming an average number of "random" encounters, and not counting any story awards, the PCs should earn about 9,000 XP for the adventure. The PDF release date is tied to the retail release date... which is today! So yes, it's available now. Ah, for some reason the link to "view the current module" from the main page didn't have the PDF option, but the link showed up on the top of the discussion page thread. Bought and downloaded, thanks! Skimmed through it. Like the premise (but I'm ez), the new monsters, and the encounters, esp the dragon. I finally got around to reading my copy, and had to pop over and say it is great. A nice interlude I will use on my party before subjecting them to "A Paladin in Hell". More people should buy this module to convince Paizo to produce other excellent level 15+ modules. well I ordered this one and hope to recieve it soon. I plan to add it to finish off the Burnt Offering setting. the group I play with wanted something past the last adventure and I think this might fit. Cant wait to give it a read and a run. My party is only 10th level, so I haven't tackled the conversion yet. I just plan way ahead. It will be PFRPG when we get there, so 3.5ish. Just bought this during the sale and will use it as the final module of the 3.5 module path campaign that I've put together. Looks great.